NASA has picked seven private spaceflight companies, each working to build a commercial spaceship, as its transportation of choice for launching experiments to the edge of space and back. The space agency announced the selections Tuesday (Aug. 9), as part of the agency's Flight Opportunities Program. The seven commercial companies will receive two-year contracts to integrate and fly an indefinite number of technology payloads on their reusable suborbital vehicles, which fly to space but do not make a full orbit around the Earth. The flights will include manned and unmanned missions. "Through this catalog approach, NASA is moving toward the goal of making frequent, low-cost access to near-space available to a wide range of engineers, scientists and technologists," said NASA Chief Technologist Bobby Braun at NASA Headquarters in Washington, in a statement. "The government's ability to open the suborbital research frontier to a broad community of innovators will enable maturation of the new technologies and capabilities needed for NASA's future missions in space." Near Space Corp., based in Tillamook, Ore.
Masten Space Systems, based in Mojave, Calif.
Up Aerospace Inc., based in Highlands Ranch, Colo.
Virgin Galactic, based in Mojave, Calif.
Whittinghill Aerospace LLC, based in Camarillo, Calif.
XCOR, based in Mojave, Calif.
"This is a big day for commercial space," Commercial Spaceflight Federation (CSF) executive director John Gedmark said in a statement. "Just as 1920s air mail purchases helped jumpstart the airline industry, we expect that NASA's purchases of flights on commercial suborbital vehicles will help accelerate this new industry. Hundreds of scientists, engineers, and educators have attended CSF workshops on the topic of using commercial suborbital vehicles, and we are thrilled to see that the R&D community will now be able to get rides to space." Armadillo Aerospace, founded by computer game entrepreneur John Carmack, is developing a suborbital rocket ship, called Super Mod, that will launch vertically and take passengers and payloads to the edge of space, at altitudes above 62 miles (100 kilometers). Near Space Corp. has experience launching high altitude atmospheric balloons and airships for NASA, NOAA and Department of Defense research. Masten Space Systems' Xaero rocket takes off and lands vertically, and completed its first free flight at the Mojave Air and Space Port in Mojave, Calif. on June 29. 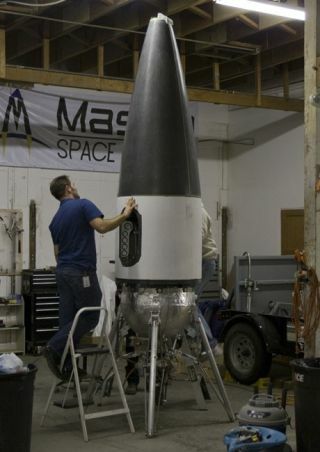 Up Aerospace Inc.'s SpaceLoft XL rocket has previously carried student experiments and other commercial payloads into suborbital space. Whittinghill Aerospace has been developing small rockets capable of launching nanosatellites. The firm has previously received funding under NASA’s Small Business Innovative Research program. Virgin Galactic's SpaceShipTwo suborbital space plane is designed to fly up to six passengers and two pilots to the edge of space before gliding back for a runway landing. The ticket price per seat is currently set at $200,000. XCOR Aerospace is developing a two-seat Lynx space plane that will take off and land on a conventional airport runway. Virgin Galactic and XCOR have already inked deals with the Southwest Research Institute (SwRI), a non-profit research organization, for research flights aboard their suborbital vehicles. NASA is aiming to use these new contracts to provide frequent flight opportunities for research and experiments on suborbital spacecraft. The agency's Flight Opportunities Program provides opportunities to demonstrate and test space technologies, and is charged with fostering the development of the commercial reusable suborbital transportation industry. Many of these companies aim to eventually carry space tourists, in addition to research, on their flights. Virgin Galactic, for example, has already sold hundreds of tickets to its first passengers, who should launch sometime in the next couple years.